The Coffee Mug for Lazy People Powered by two AAA batteries, the iCooker coffee mug is a great accessory to have in your kitchen. But more so, this is considered the best beverage-mug for 'lazy people'. If you consider the hassle of washing spoons, stirring beverages and then washing again to be quite a bother, this coffee mug simply does the work for you. All you need to do is pour in your coffee (or any other beverage for that matter) and then press a button. Does everything within seconds. Nice Feel, Great Look This premium self-stirring coffee mug looks great all the way, and feels even better on any kitchen ecosystem. The power-on button is conveniently located at the top of the hold-handle, so you can easily turn the propeller on. When empty, the inside has an appealing, clean-silverish look, which blends with the dark exterior for an overly appealing design. Easy Operation While this coffee mug looks great on any kitchen counter board and/or coffee table, its essence is to make work easier. More than the typical self-stirring coffee mug, this kitchen accessory works in an easy, convenient way. Simply press the self-stirring button on the mug and the propeller at the bottom will spin into action, mixing the solute and solvent particles into a lovely froth. 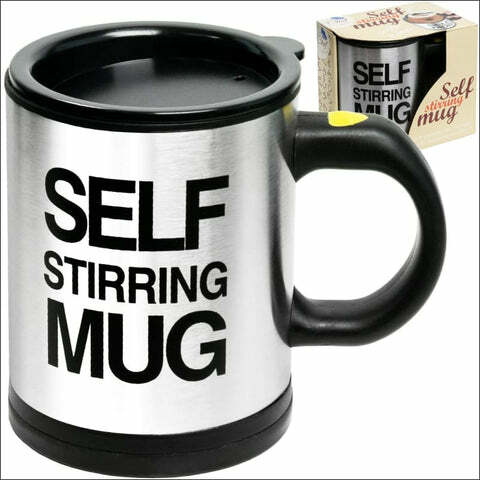 No sweat, no hassle, just a product that makes stirring beverages a whole lot easier! Airtight Lid With Small Drinking Hole If you love to sip at your coffee while you spin out of your home in the morning rush, this is the perfect accessory to have in our kitchen. The iCooker self-stirring coffee mug not just brings the benefits of instant stirring action to your coffee making moments, but also comes with an airtight lid equipped with a small drinking hole. EASY TO CLEAN - Our stainless coffee mug can be used as a normal cup for drinking if you do not need stirring function. It's also easy to wash, but do not use a dishwasher or clean by full soaking. 100% CUSTOMER SATISFACTION GUARANTEED: Chuzy Chef guarantees that you will always be satisfied with your purchase from us. We only use the best materials for our products and are always available to aid our customers. Our stainless steel coffee mug is great as fathers day coffee mug, teacher mug, coffee gifts, coffee mugs for men, fathers day mug, coffee lovers gifts, boyfriend birthday gifts, mothers day coffee gifts, men's gifts for christmas, father's day mug, gifts for brother or sister.